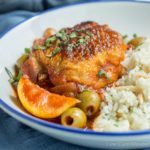 Easy Moroccan Chicken includes warm spices, bright lemon, and green olives which contribute a nice complex flavor. It’s utterly delicious over spaghetti squash or cauliflower pilaf. I’m in Texas this week with the kids visiting my parents. As I’ve mentioned in past posts, my mother is a wonderful cook who made many gourmet dishes in my childhood. The first time I had Moroccan food was at my mom’s house, about 13 years ago. 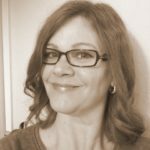 She was working as a volunteer prep/cook at Central Market’s Cooking Classes and was responsible for setting up for the classes as well as getting/prepping things that guest Instructors/Chefs needed. She also took many of the cooking classes offered at Central Market. In any case, she had the opportunity to be present while Kitty Morris was instructing on Moroccan cooking. Mom ended up buying her cookbook, Cooking at the Kasbah, and prepared several authentic Moroccan dishes for me during one of my visits. Mmmmmm. While this dish may not be authentic Moroccan, it is full of rich flavor and just enough warm flavored spice to make it interesting. I saw a recipe for Moroccan Chicken in a magazine a while back and tried it. Although good, it did not deliver the flavor I desired. With a few adjustments and additions, I was able to bring the flavor up where I wanted without complicating the dish. 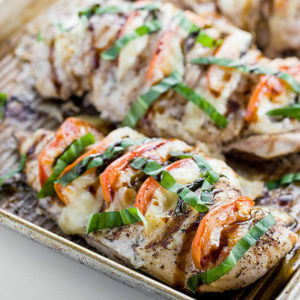 I have tried this dish with whole cut up chicken, chicken thighs and chicken breasts. I like them all. Admittedly, the whole cut up chicken and chicken thighs were a little harder for my children to eat with the bones, but my husband loved them for flavor. I have always been a chicken breast girl, so I liked that version of this easy Moroccan chicken the best. Since chicken thighs usually look nicer in pictures, I went with that when photographing the dish. So, what makes this Easy Moroccan Chicken with lemon and olives “Moroccan”? Mainly the olives and the lemon! I think an authentic Moroccan chicken recipe would call for preserved lemons, but using fresh lemons and leaving them in the dish as it cooks helps add a but of brightness as well as some bitterness which is delectable. I opted to use garlic stuffed green olives for this dish, but use any kind of green olives you want. Adding the tomatoes and keeping the squeezed lemon wedges in the dish while cooking kicked it up a notch. 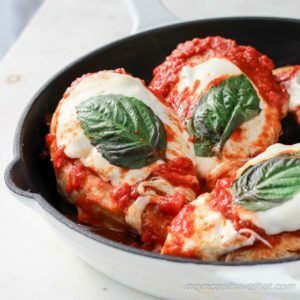 ***This is a recipe that builds on flavor so make sure to brown the chicken in the pan instead of cheating with rotisserie chicken – I know, I tried! 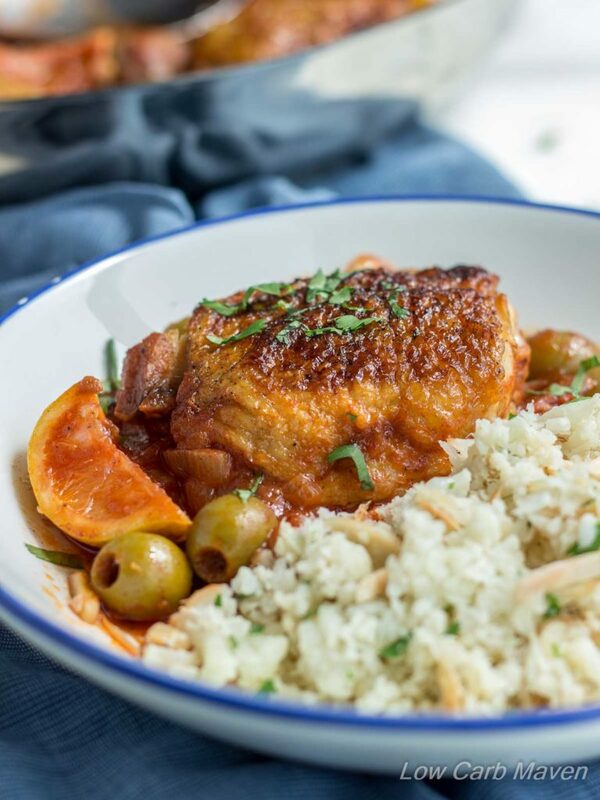 Thanks to convenience items (jarred olives and canned whole peeled tomatoes) this dish takes about 30 minutes to prepare, so it’s not only an easy Moroccan chicken recipe but a fast one, too. 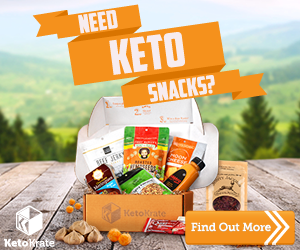 Fast and easy is always good! To speed things up I suggest having your chicken ready to go (trimmed and/or cut up) and have the onions and garlic sliced and at the ready. If you are using fresh cauliflower, grate it in the food processor and leave it raw. A quick steaming in the microwave is all it will need. I do the prep the night before and park everything on the fridge. It only takes 10 minutes. Consider adding toasted slivered almonds, browned onions, garlic salt and cilantro to the cauliflower rice for a nice accompaniment. JUST A NOTE: One night I served this dish over spaghetti squash. It was so good I just couldn’t say enough about it. Spaghetti squash is higher in carbs, but if you have a higher carb tolerance I suggest trying it over the squash because it’s warm-sweet flavor is the perfect complement for this dish! 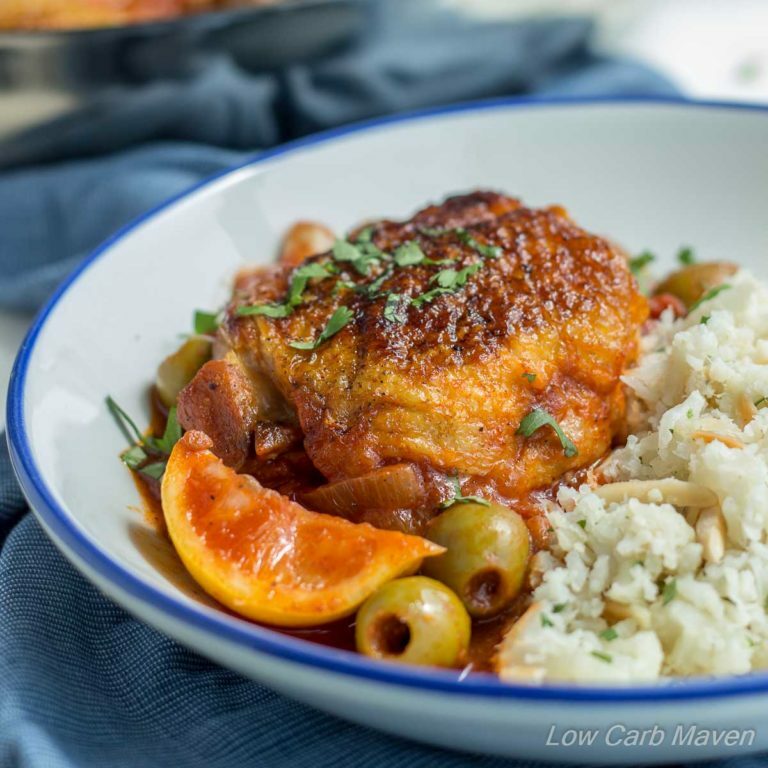 This Easy Moroccan Chicken with Lemons and Olives is 9 net carbs per serving with the cauliflower rice and is a complete meal. Easy Moroccan Chicken includes warm spices, bright lemon, and green olives which contribute to a nice complex flavor. It's utterly delicious over spaghetti squash or cauliflower pilaf. Prep: Slice onion, slice garlic, rice cauliflower and place in a microwavable bowl, cut lemon, chop cilantro. Open can of tomatoes and measure 1 cup of olives. If using chicken thighs with skin, trim off the excess skin and fat. Pat the chicken dry. Pour about 1-2 teaspoons of oil over the chicken, distributing over all surfaces. Season thoroughly with salt and pepper. Add 1 tablespoon of oil to the pan (omit if using chicken thighs with skin) and add the onions and garlic. Saute for about 2 minutes or until softened, then add the garam masala and paprika, cooking until fragrant. Add the whole tomatoes to the pan crushing them into the pan and add the juice from the can. Squeeze the juice from the lemons into the pan and add the spent sections. Stir. Add the chicken back into the pan and the olives. Cover lightly with a piece of foil and simmer covered for 15 minutes and uncovered for 5 more (or longer if you want the sauce thicker). At the end of cooking, add two tablespoons of extra virgin olive oil (omit if using chicken thighs with skin) and cilantro. Cauliflower: Towards the end of the Moroccan Chicken's cooking time, steam the cauliflower in the microwave. In a small pan, saute the onions in the ghee or olive oil until browned and add to the cauliflower, season with garlic salt and pepper. Stir in slivered almonds and chopped cilantro. Serve: Discard the lemon wedges and serve the chicken over the cauliflower rice or to the side. *I do as much of the prep work the night before so the dish is ready to go. If you can, let the chicken sit out on the counter for 15-20 minutes before cooking to come to temperature a bit. This helps it cook more thoroughly and prevents the chicken from being "shocked", keeping it more tender. Hi. 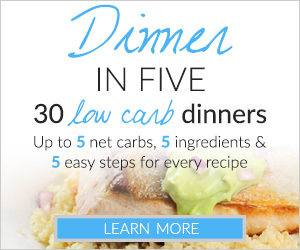 Been cooking low carb for a few years and just stumbles across this recipe. Looks good and am gonna try it tomorrow. Question: how much would the recipe change if Unused pimento stuffed olives? Do you recommend not to? Thanks in advance! Sorry – bad thumb texting lol! I meant: Could I use pimento stuffed olives or do you suggest I remove the pimentos prior to cooking? I don’t cook much with green olives…. 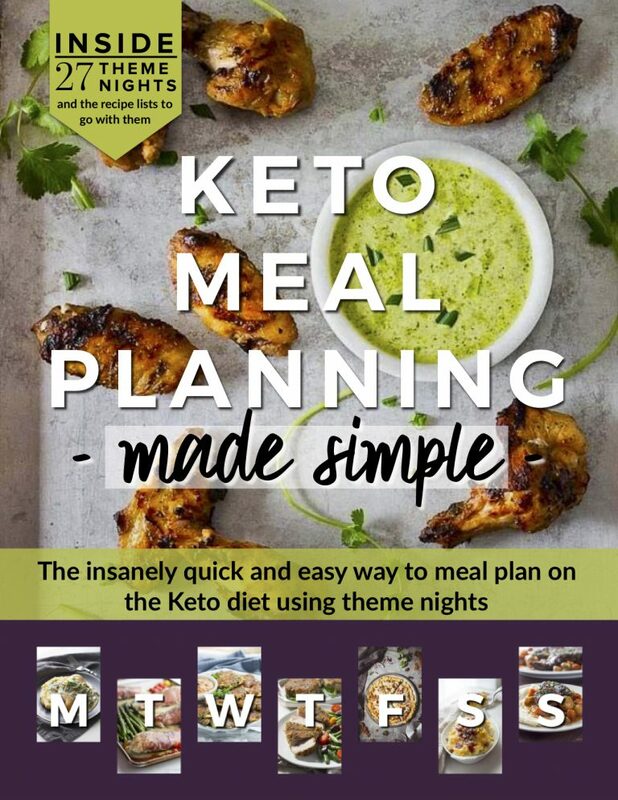 Your recipes are fabulous! Thank you so much! I love Moroccan food and this chicken looks absolutely incredible, such a delicious ingredient list! 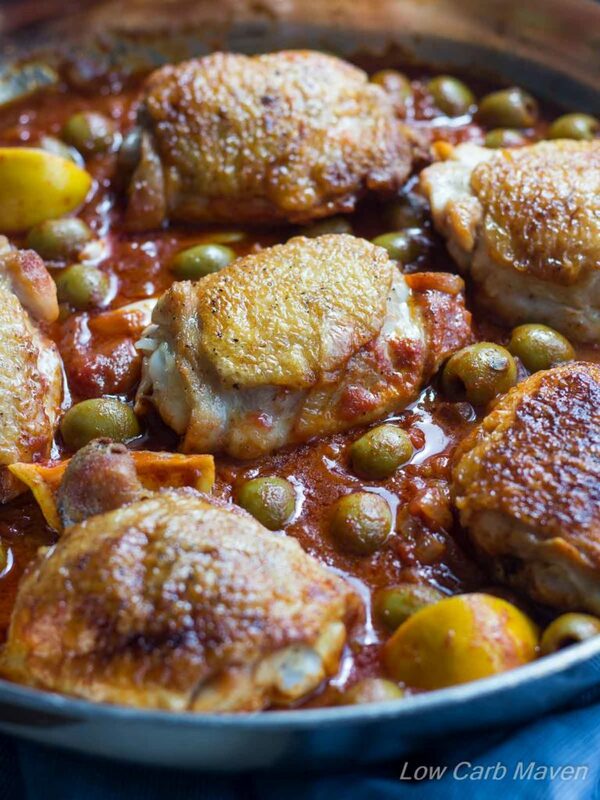 Kim, your Easy Moroccan Chicken with Lemons and Olives looks absolutely Fantastic! Woman, you have done it again. You are so amazing in the kitchen! I will be trying this very soon! I love that it is easy. I think I have most of the ingredients in my house already, so this just might be dinner! Thanks for the recipe and inspiration! This is such a beautiful looking dish! Lemons…olives….YUM! Hope you have a wonderful visit with your parents! There’s nothing better than going home for a visit! Kim, this looks wonderful! I love Moroccan food! So your nutritional information includes the cauliflower pilaf?